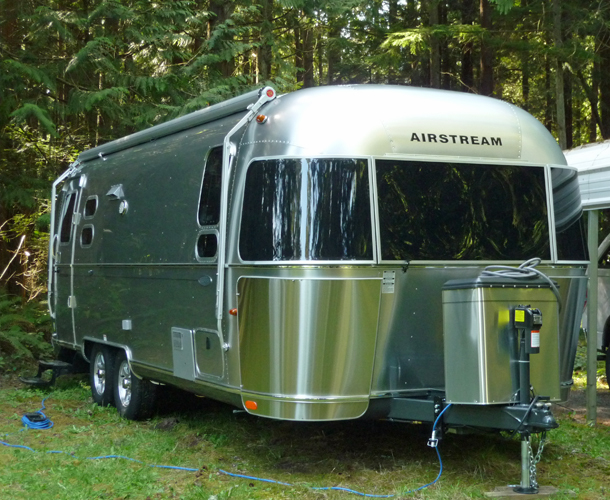 Genevieve, The Silver Palace, is an Airstream Flying Cloud 25FB. The FB stands for front bed. We purchased her at the end of April in 2014. 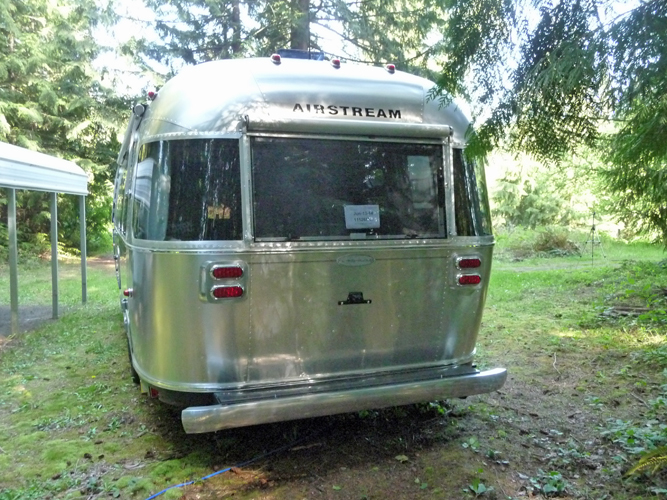 The plan at the time was to do a little campground hosting and spend the winter in California and Arizona in her. We'd just sold our home on 2 acres in Monroe, WA and planned to downsize and buy a smaller one-story home in Gig Harbor, WA. After 10 days of house looking (and even finding a home that fit all our criteria) we realized that we didn't want a house. In all likelihood, we'd only live in it for 3 or 4 months a year. Who was going to take care of it the rest of the time? It was so nice having the freedom of not having a house to take care of that we decided we'd give full-timing a try. 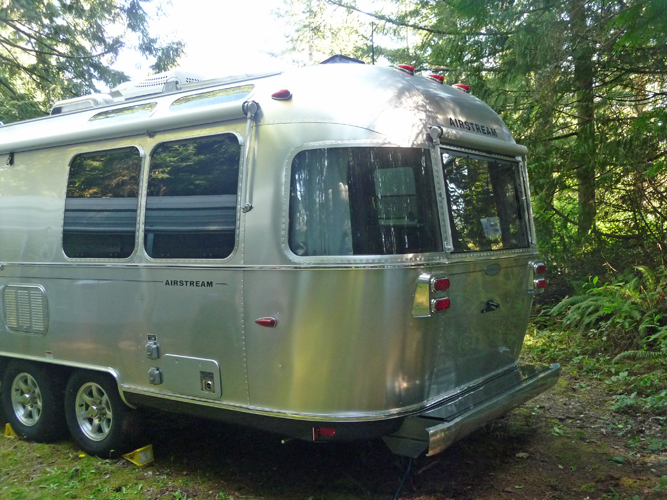 The longer we've lived on the road, the more we've enjoyed it and the less we want a house. That may change someday but until then, Genevieve is all the house we need. She has a large awning on the curb side and her door at the rear. 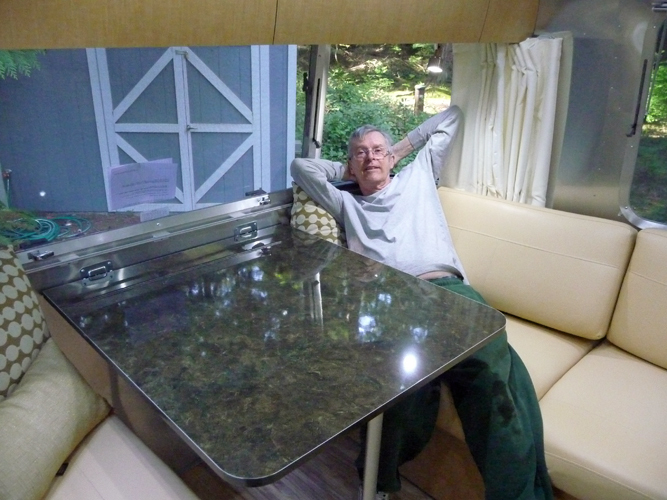 There's a small awning over the rear windows which gives us shade at the dining table. She has a medium sized awning on the street side. The front end has no awing but that's okay, that's just the bedroom behind those windows. There are rock guards over her windows up front and steel rock guards below to protect the aluminum from flying gravel and the like. The two propane tanks are under that shiny box up front. 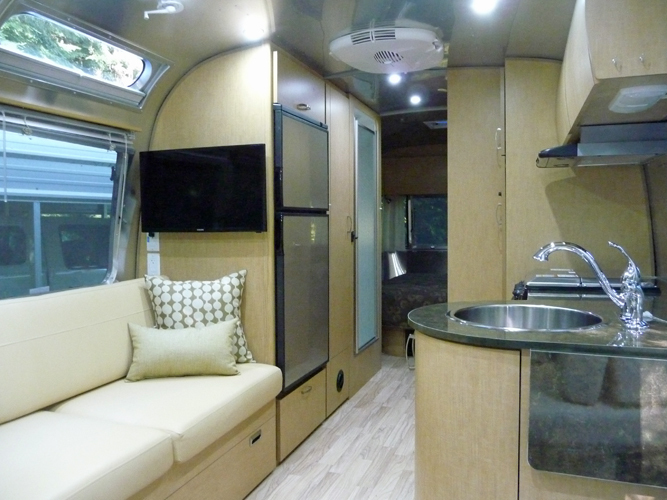 Inside, she came fully loaded with leather upholstery, LED lighting, two TV's and a BlueRay player. Here's Walter in the dining area. He can sit there and watch football on the TV. That's the refrigerator just past the TV and then the shower. 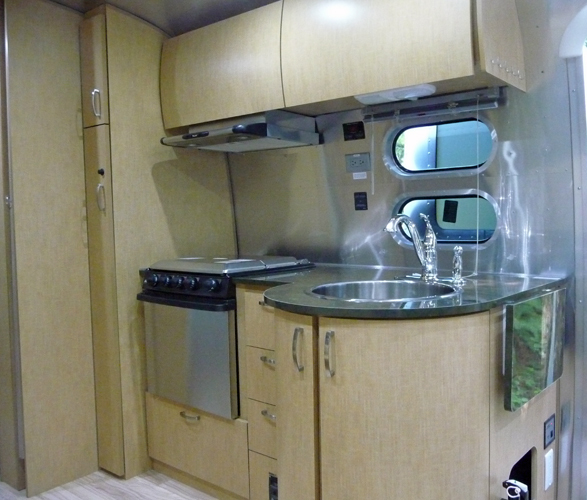 The kitchen has that nifty round sink, three drawers! 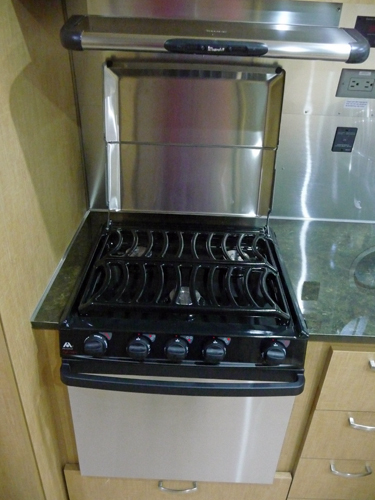 !, a three-burner cooktop and an oven. There's also a pull out pantry which holds tons of food. After cooking on a two-burner stove in the Casita for 12 years, having 3 burners and an oven is heaven. 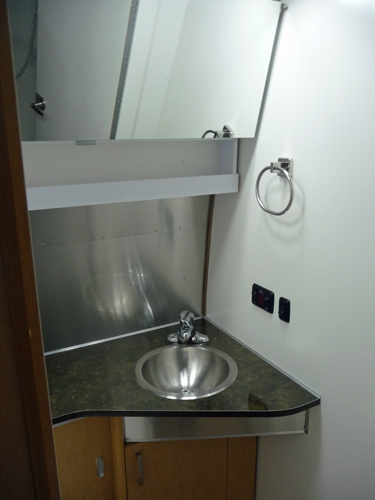 The bathroom has another cute round stainless steel sink, a china toilet and tons of storage. The bed is another bonus. You can actually walk around 3 sides of it. 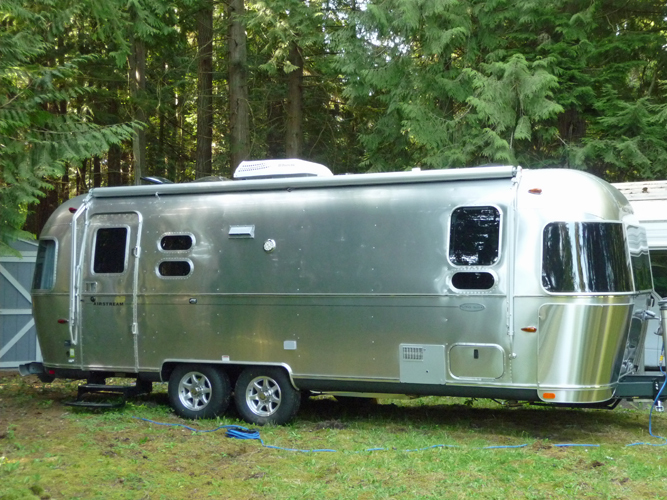 The side up against the front of the trailer is a little snug but it's so much better than the Casita. 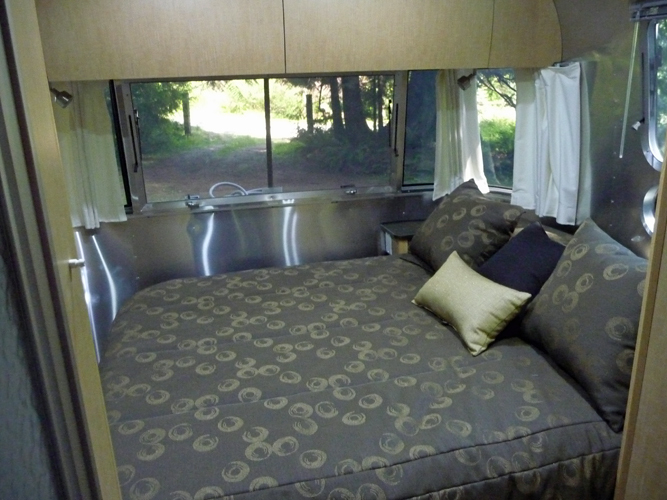 And the bed lifts up and provides a bunch of storage underneath too. We each have a closet and a good sized drawer and then there is storage above the bed and above the dining table and under all the seating in the living/dining area. It's just right for us and we love it. Copyright Winterhaven Press 2014 All rights reserved.